From 11 to 20 in October. In Gijón de Sidra, this year the 37 most outstanding cider houses of the city, three more than last year, opening its doors to all those passionate about the world of cider so they can enjoy the best gourmet ciders, from the 37 best llagares of Asturias. Each cider house welcomes "the cider stick" of an assigned llagar, establishing an attractive price, which includes: a bottle and a casserole as an accompaniment to a single price of 3 € and 4 €. This year they celebrate 5 º aniversario and new developments continue to be incorporated the Sidrobús®, which will travel the city on Fridays and Saturdays continuously from 20hrs to 24 hrs with stops at 7 key points near the participating cider houses. The Sidromapa® and the official handkerchief of Gijón de Sidra can be obtained in the participating cider houses to take the Sidrobús® and enjoy the route through the best llagares of Asturias without leaving the city. 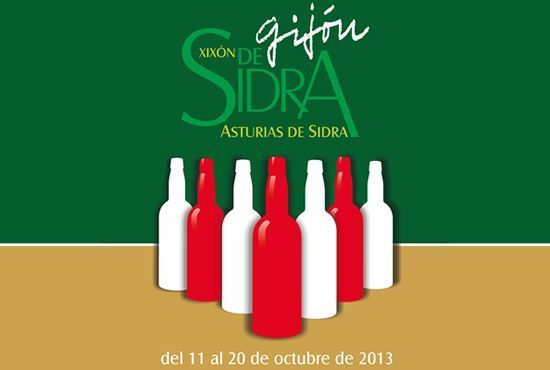 All participating cider houses appear in the official information tool, the Sidromapa. It consists of a Guide that shows, on the one hand, the proposed routes with the participating ciders and the type of quality cider that they offer, and on the other, the map of the producer producers of the brands that each one hosts (name, location, varieties produced) ) so that it is didactic and correctly locates what is going to be tasted. I Contest "Cancios de Chigre"
It is reserved for registered choral groups as such, it will take place in the participating cider houses of "Gijón de Sidra". Each choir must interpret 4 songs in a maximum of 5 cider houses. The organization will establish day, cider houses and timming for them.